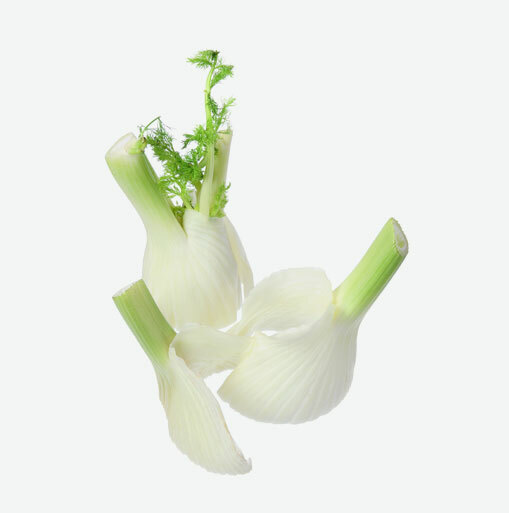 Also known as Fennel, this vegetable has a sweet, mild licorice flavour. It is quite popular in European cuisine, especially in Italy and France. The feathery fronds can be used as an herb, like dill weed, to flavour soups and stews. The rounded, somewhat large bulbous base is treated like a vegetable. Please note that it is not to be confused with herb anise, which is grown for its seeds and sold as a seasoning. Anise is a good source of potassium which is beneficial for blood pressure. It delivers a lot of Vitamin C which is important to healthy teeth and gums as well as strong healthy bones. For those counting calories, anise is a great choice because it is low in calories and it is sodium, fat and cholesterol free. Choose firm, white bulbs with bright green fern-like leaves. Refrigerate unwashed anise bulbs in a plastic bag for up to 1 week. Before consuming the anise, trim off the stalks where they meet bulbs. Rinse the anise bulb and separate the layers; cut into strips to use on a veggie platter. Slice or dice for stews, soups, and stuffing and salads. A traditional Italian salad combines sliced anise with peeled, sliced oranges; drizzle with olive oil and salt a pepper to taste. In a well-oiled casserole dish, top steamed anise bulbs with a cream sauce and grated cheese such as mozzarella or your favourite grated cheddar and bake.